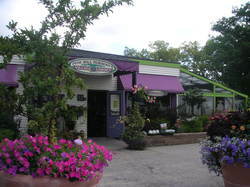 Featuring a Garden Center, Nursery, Bagged Soils and Mulch, Home & Gift Shop. Visit our beautiful secret garden hidden just off Garfield behind Save-a-Lot and Randy's Diner in the Heart of Traverse City. A Northern Michigan plant nursery and landscaping destination! Featuring 7 Greenhouses, the largest plant Nursery in Northern Michigan, Garden center, extensive display gardens including ponds and waterfalls, Bulk and Bagged Soils and Mulch, Home & Garden Gift Shop, and the Garden Café and Wine Bar. A little out of the way but way worth the trip: 10 miles north of Elk Rapids or 20 miles south of Charlevoix on scenic Hwy 31 on Torch Lake.